O gula melaka, mother of Southeast Asian sugars. Also known as palm sugar, it is made from the sap of flower buds of the coconut tree. Most commonly found in chendol and ondeh ondeh, we went around Singapore to suss out 10 gula melaka desserts that will give you a sugar rush. 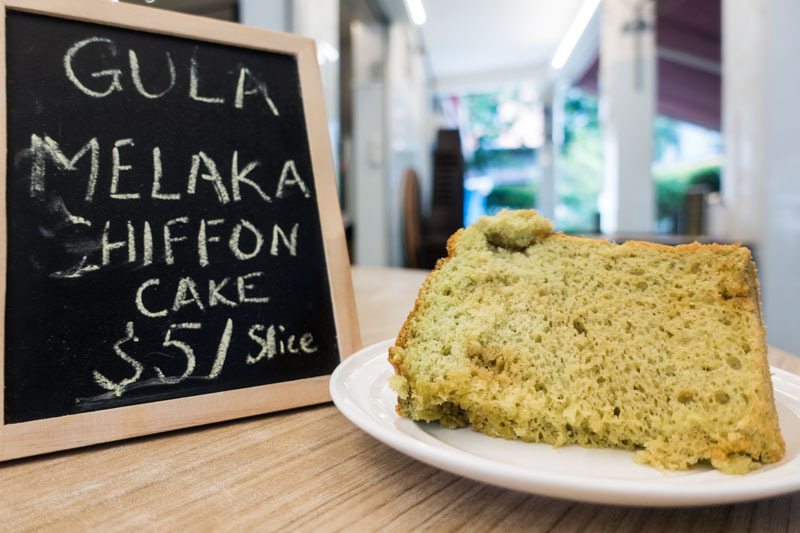 Hidden within Tiong Bahru, this Gula Melaka Chiffon Cake (S$5) from Cheng’s at No. 27 was absolutely soft, fluffy and slightly moist in the middle. The gula melaka was subtle yet distinctively aromatic, with the brown sugar bits still visible. But what warmed our hearts the most were the friendly owners and the story behind the creation of this recipe, which originated from a mother wanting to make a healthy and delicious cake for her daughter. Who would have ever thought of transforming the classic ondeh ondeh into a drink? Well, the genius minds behind Mellower Coffee did. 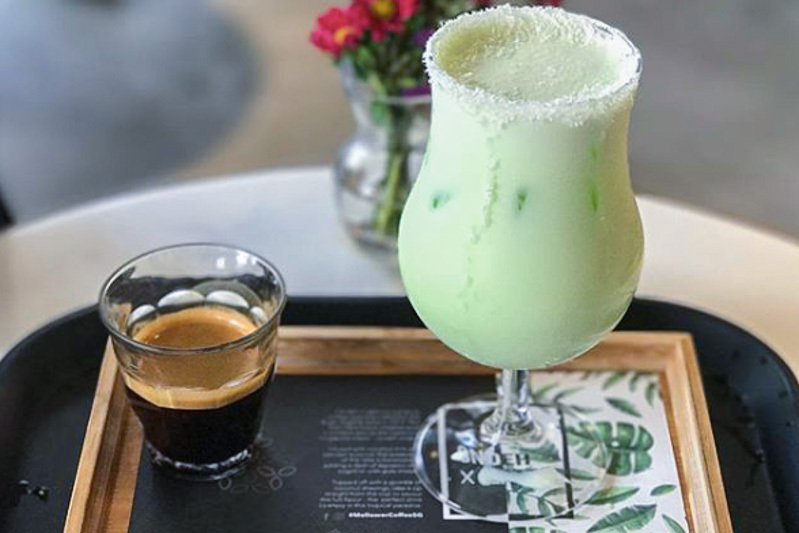 The Ondeh X Latte (S$9.80) has coconut milk and pandan served with a shot of gula melaka coffee. The slight bitterness of espresso paired with the sweet gula melaka and coconut milk was ingenious. This drink was also specially created for the flagship store at Bugis. Make sure to take some Insta-worthy shots of this drink before slurping it up! Japanese-style hotcakes with gula melaka? Yes, please! The Pandan Hotcakes (S$9.80) at Two Bakers tasted dense yet moist, which is the way we like it. The gula melaka sauce, accompanied with the bananas and strawberries, also provided some sweetness which was not too overwhelming. Meet the brainchild of ondeh ondeh and lava cake: the Ondeh Lava Cake (S$14), which was created during National Day 2018. The oozing gula melaka when cut open, accompanied with salted coconut ice-cream, this dessert screams ondeh ondeh but with an interesting twist. This popular dish is a remake of the classic and beloved kaya toast, which is affectionately named My Interpretation of Kaya Toast (part of S$58 three-course meal). 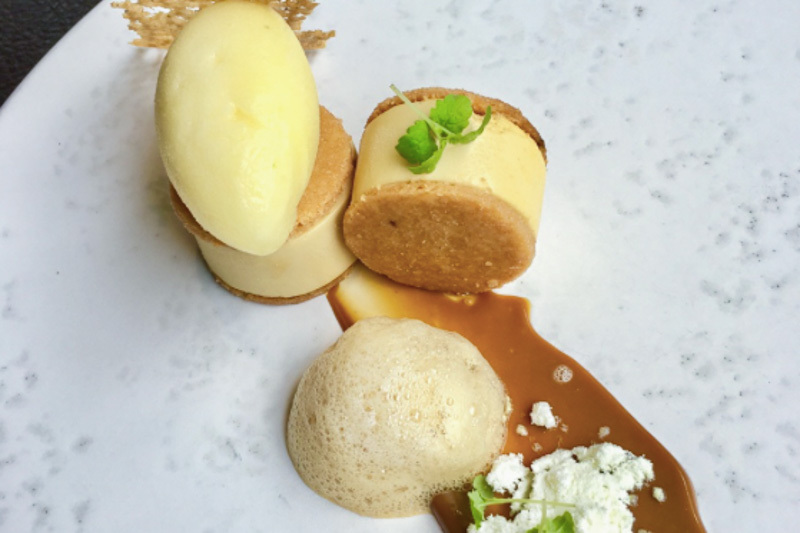 Rich gula melaka and pandan ice cream are sandwiched between crumbly sable biscuits, while the light pineapple sorbet provided some balance to the dessert. 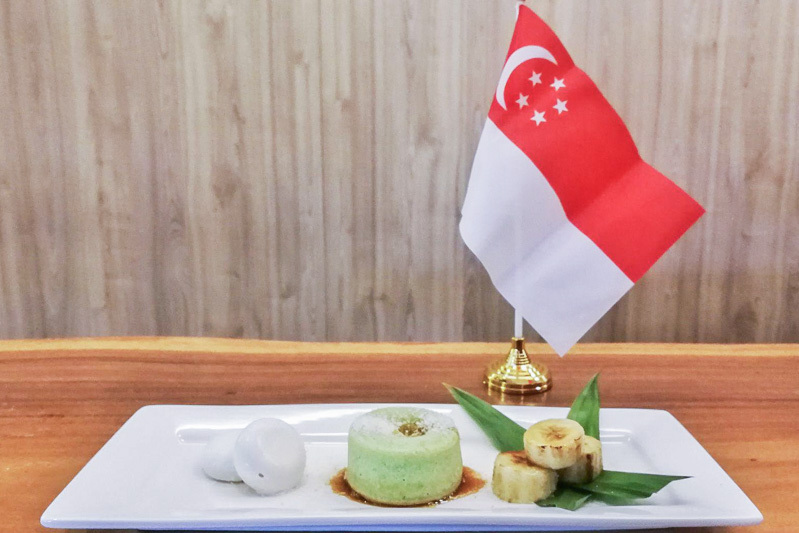 This dessert was also featured on Singapore’s Michelin Guide 2017, with chef Jason Tan sharing his inspiration behind the making of the modern take on Singapore’s beloved breakfast. 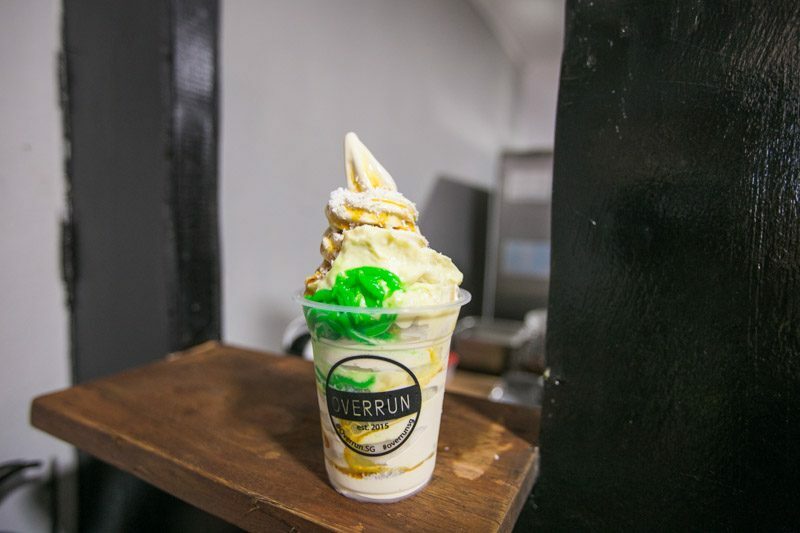 A twist on the regular chendol, this cup of goodness is actually Durian Chendol Softserve (S$7), served with durian pulp and a generous serving of gula melaka sauce drizzled over it. Coconut flakes and pandan jelly topped the whole confection. It is a really good dessert if you want something new yet still comforting. This Chendol Softserve will definitely satisfy your cravings! Churros Factory’s Ondeh Churros with Gula Melaka Sauce (S$5 for three pieces) makes for a convenient takeaway dessert. 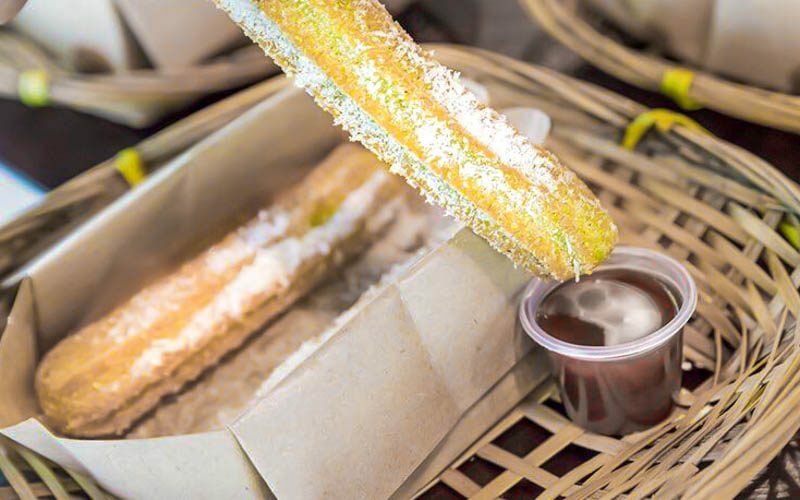 The three churros were soft on the inside and crispy on the outside, with a side of rich gula melaka sauce. How can anyone say no to that? It’s a great choice if you’re looking for a light taste of gula melaka without feeling too full. 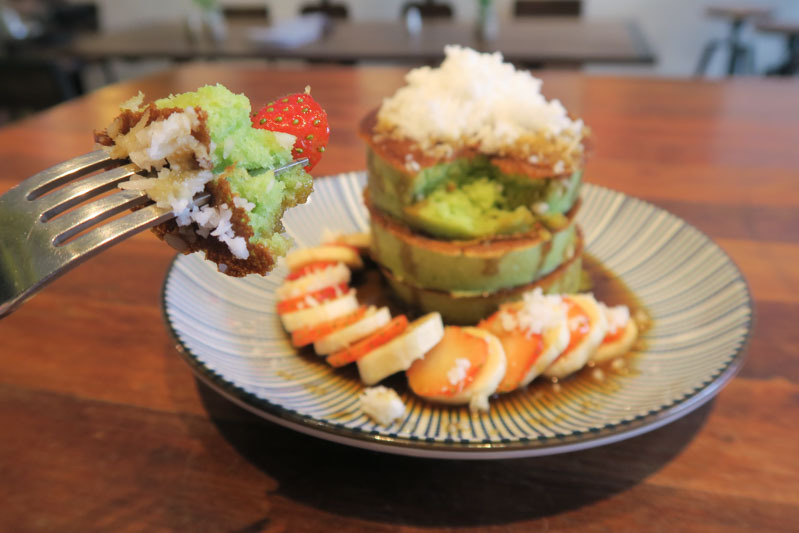 Avocado-themed dishes have been really popular, and All The Batter’s Avocado Gula Melaka Slice (S$6.50) mixes avocado with gula melaka to make it even more interesting. With soft and creamy avocado slices sandwiched between layers of cake and frosting, it was easy to appreciate the blend of flavours. 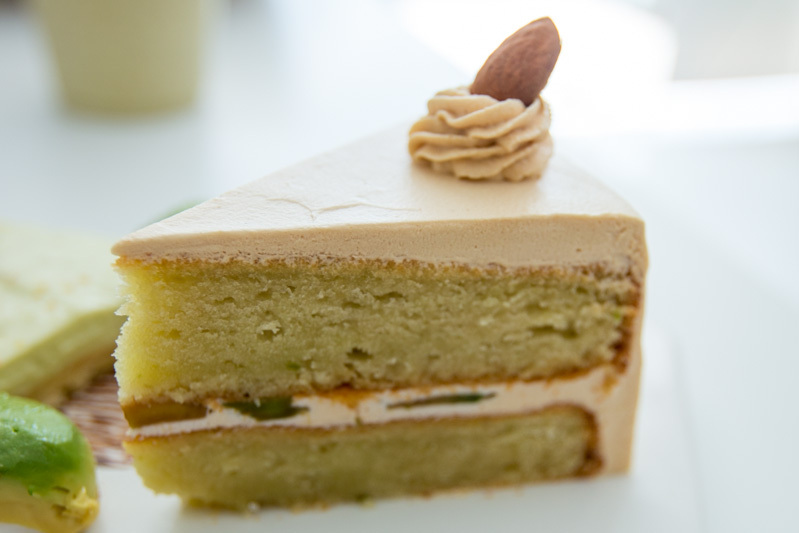 Instead of butter, All The Batter uses avocados in their cake mix for an even stronger flavour. 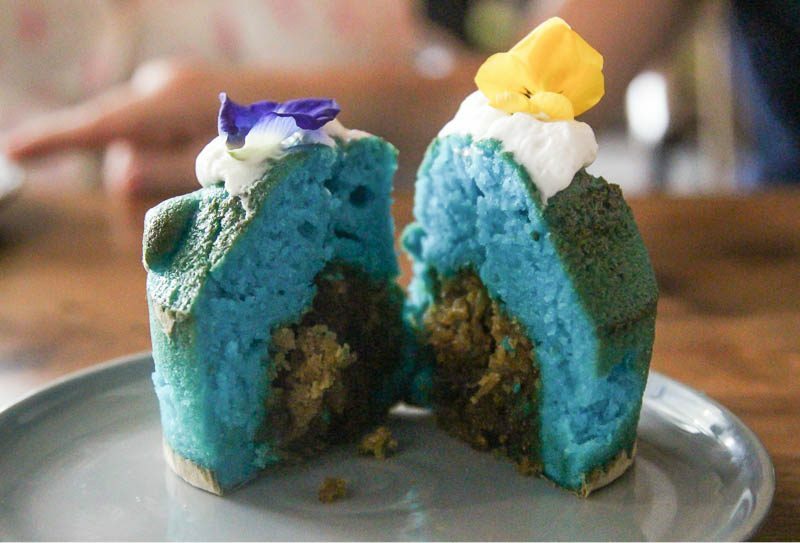 The Peaflower Coconut Muffin (S$6.50) was pleasing to the eye with its bright blue colour. Within the muffin is a generous filling of gula melaka-infused coconut shavings. The dessert combined different textures, including the soft interior of the muffin and crunchiness of the coconut filling. Do give this dessert a try, because this muffin with a rich gula melaka fragrance is really unique! 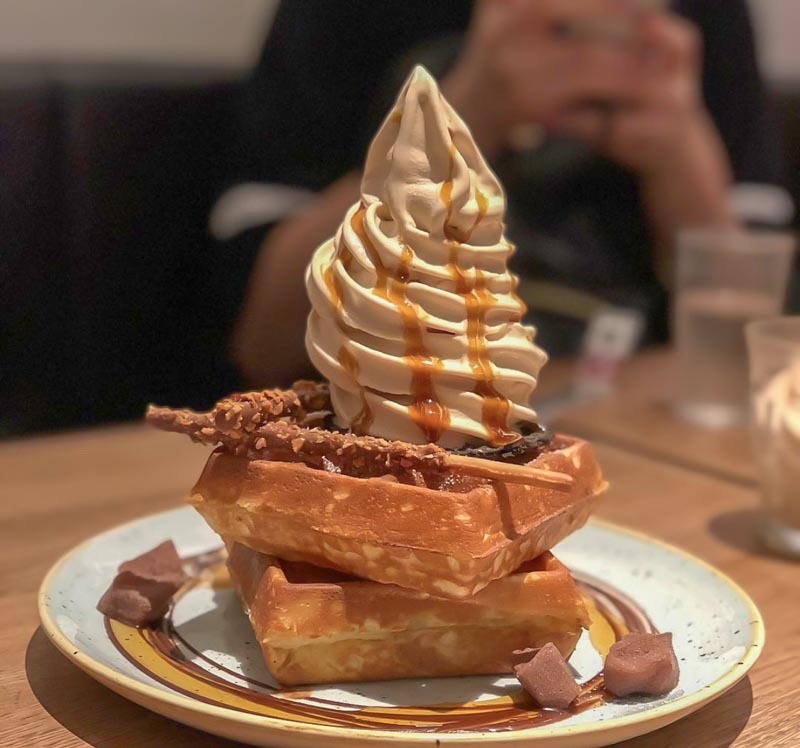 The last but not least of these gula melaka desserts is Sunday Folks’ Gula Melaka Softserve with Double Stacked Waffles (S$15). One of the most popular forms for gula melaka desserts has to be soft serve! This soft serve tasted creamy and had the distinct flavours of the coconut sugar. A tinge of sea salt in the soft serve balanced out the sweetness of the gula melaka.